As Alzheimer's disease and related dementia diagnoses continue to increase in Niagara County, Niagara Hospice is committed to devoting significant resources toward customizing patient care and enhancing family support options. This growing population has many unique needs while living with various symptoms and challenges. Additionally, these patients' families and caregivers experience great stress and fatigue in managing their care. In Niagara County, approximately 4,000 residents are affected by Alzheimer's disease or other dementia conditions. In 2018, Niagara Hospice cared for more than 250 patients with dementia-related conditions, comprising nearly 30% of all admissions. 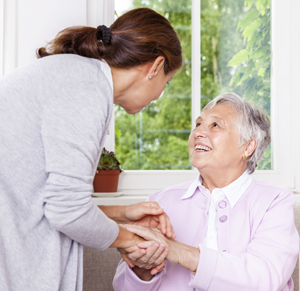 Niagara Hospice offers a dementia patient care and family support program. We have a dedicated dementia care team with certifications from the National Council of Certified Dementia Practitioners (NCCDP) to ensure the highest level of care for our patients and comprehensive support for their families. Anyone can refer someone online to us for dementia care and support. You can also call 439-4417 or 716-HOSPICE. Treating dementia demands a more specialized approach as the conditions are not the same as other end-of-life care. Prescriptions are not always the best option as there are so many different symptoms that surface and side effects can be equally difficult. Care needs to be driven more by the non-medical plan and advanced assessments of the wide-ranging behaviors related to the diagnoses. Too many patients in our communities are suffering with dementia and lacking the proper care and support they deserve to maintain their quality of life. Niagara Hospice is changing this every day with our dementia care program. For more information or to make a referral to the Niagara Hospice dementia care program, please call 439-4417.